Time : 1:00 p.m. - 4:00 p.m.
You will be receiving 6 pre-cut cards that will be ready for you to stamp and put together with some instruction from me. Envelopes are included. Below are the pictures of the cards. Please RSVP by Monday, June 16th if you would like to come! I'm working on updating my blog. Please hang in there with me! I just came home from Convention 2012 in Salt Lake CIty. This year's theme was "I am". The staff at SU made this wonderful video to go with the theme. The staff all did a "lip sink" to the song. SU played this on the big screen on the first day of Convention. It's a great song with a great theme. Hope that you enjoy it. I'm hoping to be posting some pictures soon. Sorry I've been so busy that I've haven't had any time to post. 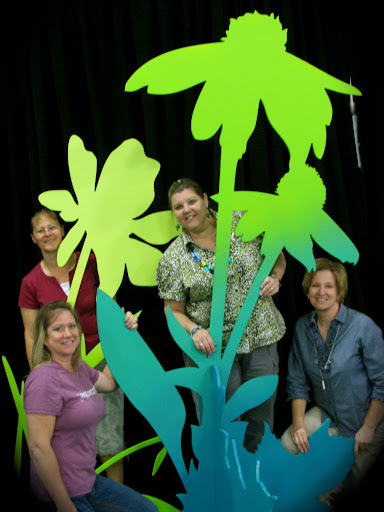 FUN IN THE FLOWERS AT 2011 STAMPIN UP CONVENTION! 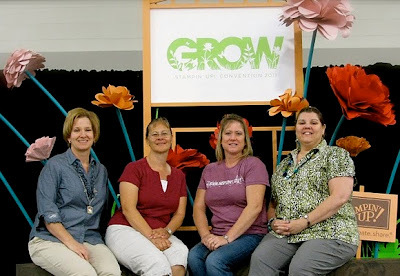 Me and my Stitchedstamper buddies are playing in the flower props at the Salt Palace Convention Center where the 2011 Stampin' Up Convention was. The theme this year was "Grow." BONUS TIP.. use the little extra pieces from the Blossom Bouquet punch for the candle FLAMES! make the cake stand out of punches. This month at Stamp Group I taught the ladies how to do the Heated Ribbon Technique. It's so cool to watch the ribbon shrink to the design that you want just by putting the heat tool next to the ribbon. 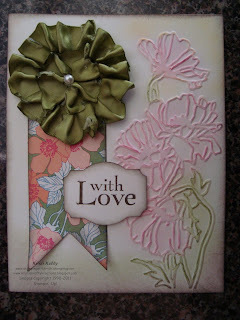 I used all products from SU, Sticky Sheet cut from the 2nd largest size circle on the Circle #2 Big Shot die. I used about a 19" piece of the Old Olive Satin Ribbon cut at 1" intervals, about 1/8" in all the way down the length of the ribbon. 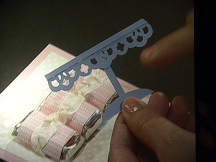 Take off one side of the Sticky Sheet and start pleating the ribbon all the way around until you get to the middle. Heat the ribbon up until it looks like you want it. Cut the same size circle of C/S to match the ribbon. Put that on the back side of the sticky strip after pulling off the white backing of the sticky strip. Put a pearl or something in the middle of the ribbon flower and you're done. The DSP is Beyond the Garden. The embossing folder is Flower Garden. The flowers were colored with Pastels. Everything was sponged with Early Espresso Ink. 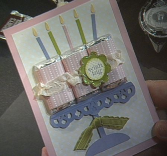 This next card was CASE'D from My Creative Corner. I made a few small changes to it to make it mine. 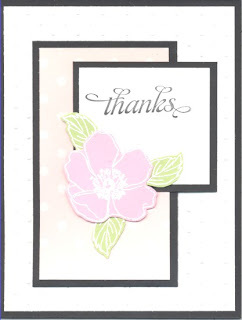 The flower was embossed with Winter White embossing powder on Pretty in Pink c/s & Certainly Celery for the leaves. The flower was popped up with Dimensionals. The color didn't come out very well. The DSP was Pink Pirouette polka Dots & the background white mat was ran thorough the Dotted Swiss Embossing Folder. Click on this link to find all the details about the Late Night Stamper Events for next year. I'm marriend to a wonderful husband that supports me in all I do. I'm a mother to 3 children ages 21, 18, & 13. 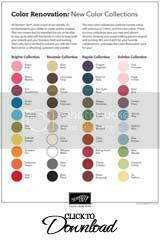 I've been an Independant Demonstrator for Stampin' UP! for the last 11 years and I'm still loving it. I also work 35 hours a week at a Technologies High school in the Dean's/Student Services office which I enjoy most of the time. I love to see how the children grow and change over the years. I'm very involved in my church and in the activities that my children are involved in at school and at church. I love to meet new people. I receive a great feeling when I'm able to teach people how to be more creative and how to make beautiful works of art.